What's the Difference Between Memory & Storage? What’s the Difference Between Memory & Storage? One of the most confusing sets of terms in everyday computer usage is “‘Memory’ & ‘Storage’.” People often use one term when they mean to refer to the other thing. It can be confusing because both memory and storage are measured in the same units: bytes, kilobytes, megabytes, etc. This is because both memory and storage are places to hold your data, but they do very different things with it. 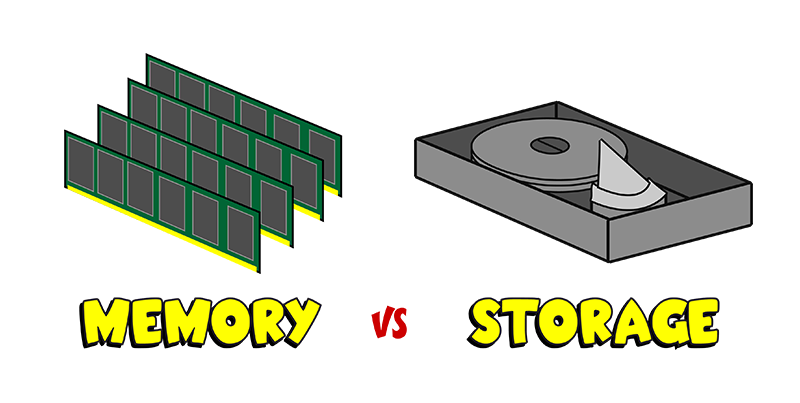 The two components that ‘memory’ & ‘storage’ refer to are RAM & the hard drive. The memory is known as RAM. It is is a part of your computer that it uses while it’s powered on. Your computer stores everything that it’s thinking about in RAM. If you’re running a program, it’s in RAM. If you’re looking at a webpage, it’s in RAM. RAM contains everything that’s currently going on with your computer. And when RAM is in a computer that isn’t powered, the RAM is empty. It’s just waiting for something to think about. The more memory your computer has, the more it’s able to think about at the same time. More RAM allows you to use more complex programs and more of them. ‘Storage’ refers to long-term storage. Everything that your computer knows, but isn’t thinking about, is in storage, written on the Hard Disk Drive (HDD). This is a permanent type of storage: hard drives can be unplugged and contain the same information as when they’re plugged in or turned on. Nothing actually gets changed on the hard drive: it gets pulled off the hard drive, into RAM/Memory. While it’s in memory, you as the user can change it. When you save the information, it gets sent back to the hard drive storage in a different version. More hard drive storage allows you to store more things on your computer. However, it rarely affects your computer’s performance. A computer with 1 gigabyte of RAM will work at the same speed whether it has 2 gigabytes of storage or 2000 gigabytes. Visit The Nerds: Having hardware computer problems? Come into our Sacramento computer repair shop or one of our other locations across California and Oregon to get your computer fixed today! Having software problems? We can help you with that too, no matter your location with our online computer repair service. Like This? We have more! Sign up below to be kept in the loop and be sent more content like this in the future!